My favorite stretch of road near my neighborhood. Today was already an unusual day. Due to being a single father for a week, and because my schedule was going to keep me at school late today, I had to skip my lunch and my planning period to come home to walk my 4-legged son, Meril. Because of the time it takes to get to work, I usually don’t drive to and from work more than once in a day, and I’ve never attempted a trip home and back during the school day. I knew I was going to have just the right amount of time to make it all happen. One of the greatest parts about the drive to and from our neighborhood is a stretch of black top road with several winding hills and lots of trees, a small bridge over a creek, and it’s not uncommon to see an occasional deer just relaxing and enjoying the same setting as your drive by. It’s the part of the drive that creates the illusion that you’re not in strip mall and parking lot filled suburbia. It reminds me of growing up in small town country. I was about halfway through this stretch of road, on the way home, and was busy listening to MSNBC on my SiriusXM radio. I was very tired. I wasn’t nodding off, but I was definitely tired and relaxed, one of those times you’re on auto pilot and suddenly you’re at your destination but don’t remember the drive. I also remember that around this time I was thinking of someone who recently lost their mother. All of a sudden, mixed in with the drone of the female news reporter, I heard my name, “Patrick”, clearly and almost sternly. It seemed to come through the radio, or at least from the speakers in my car. I felt that familiar charge over my body and I’m sure I had goosebumps. Whatever happened just instantly got my attention. This kind of experience has only happened to me once before. It was an average day while I was going about my normal routine. I was walking into the front door from an early walk with Meril before leaving the house. I heard my father’s voice say my name like he does when he’s trying to get my attention. The first weird thing about that was my father is very much alive and lives three hours away. I called my parents on the way to work to find my mother had a similar experience a few hours earlier when she woke up in the middle of the night to find my father not in the room. Very strange. Anyway… back to the voice in the car. Within seconds of hearing this voice I was alert and waiting for a sign or another voice, and I asked out loud if someone was trying to get my attention. Nothing. Was this pareidolia (matrixing)? Did the consonants and fricatives in of this woman’s voice in between words just magically fall into place to form my name? Is it possible that the report really did just say “Patrick” for some reason and it grabbed my focus? Or was this a completely separate entity using my car’s radio or speakers to get my attention? Or perhaps I’m just simply crazy. I found myself comparing this experience to spirit box sessions and how easily you can force yourself to hear something. But in this situation I wasn’t forcing myself at all. I wasn’t even actively listening, and other thoughts were in my head during this time as well. But it was sharp and clear and got my attention. Was this a spirit guide waking me up? Was it the crossed over parent of the person that was in my thoughts? I suppose I need to stay alert for a while. As promised, I want to keep my readers posted on this last session. On the late afternoon of December 26th, 2012 I held another Ouija board session, once again incorporating the spirit box and recording it all on a digital audio recorder. This would be the first time I held a Ouija session on my own. Other than Meril (my four-legged son), no one was in the house. And no, his paws are not allowed on the planchette. After a very brief meditation and stating my respectful intentions, the session began and lasted about 25 minutes. The conversation on my end went pretty much like one of my typical EVP sessions with a few added questions specifically aimed at the topic of the Ouija. I also made sure to ask for any feedback or suggestions on how to make the communication more successful. Once again there was no communication via the Ouija board. I encouraged any spirit present to also communicate through standard EVP and my audio recorder. Other than one small instance where there is an unintelligible and very soft possible response that may or may not be paranormal, no voices were captured. For the second half of the session I turned on the spirit box and continued to wait for a response through the Ouija board. The radio waves were very active with chatter, but at one point in the recording I can hear a possible response of “spirit”. Later, after I asked “What am I touching?” I can make out a fuzzy robot-like “Ouija… board”. A response like this (since my brain is wanting to hear “ouija board” anyway) could easily be pareidolia (matrixing), but I’m open to the possibility. Seemed like a perfectly good excuse to share a picture of my handsome son. Oh… and I almost forgot. Toward the very end of the session while the spirit box was buzzing away, Meril growled as he stared down the steps to the lower level. It is pretty unusual for him to growl inside randomly so it caught me off guard. There were no relevant spirit box responses and there was no movement from the board. This may have been nothing, or possibly he was distracted by the spirit box itself, but I felt it was worthy of mentioning. Due to life and work I’ve definitely not been regularly conducting spirit communication experiments in the last several months, but when I have I’ve been disappointed, for the most part. I’m trying to keep my spirits up (no pun intended). I move that we, as paranormal investigators and researchers, stop placing so much importance and confidence on one-syllable “responses” when recording for EVP (Electronic Voice Phenomena). Whether you’re capturing your EVP through traditional recording methods or through opportunistic methods like white noise generators, radio sweep/spirit box, etc, one-syllable sounds or “responses” are commonly captured. These sounds can certainly satisfy an EVP craving, especially when they happen after we ask those oh so challenging questions requiring a “yes” or “no” answer. After all, you’re eagerly awaiting a wise response. They really can be paranormal (and some of them clearly are), but compared to longer phrases or patterns with more than a single syllable, I feel they’re way more likely to be either imagined or simply one-syllable sounds (either created by investigators, the clipped voice of a DJ from a random radio station, or sounds found in the natural environment) confused for common responses like “yes”, “no”, “hey”, “stop”, “leave”, or any of the single-digit numbers that we always seem to hear. This is often referred to as “pareidolia” or audio “matrixing”. A creak in the house, a car door shutting from nearby, a bark from the neighbor’s dog, or any slight movement you make while recording can be the cause of these sounds. I think sometimes we’re listening for and hoping to hear things that are paranormal, therefore that quick scratch of your arm through your shirt ended up being a response of “yeah.” I think I annoy fellow investigators a lot because I tend to be more conservative (the word “conservative” is ugly, but so is that annoying phrase “openly skeptical”) in my listening and determining what I’m hearing in recordings. Most of the time I probably end up going with my first instincts. If from the beginning it sounded like a scratch, or the shuffling of a piece of paper, or a footstep on a dusty floor, then in my opinion any words or “responses” that you can force yourself to hear from that noise are accidental. Of course then there’s the opinion and theory that spirits may just take advantage of those natural environment sounds or our own movements to create their communication. It’s possible. In most of these cases I think they’re important to note or document. But to classify some of these as “paranormal” or “EVP” is a bit reckless, in my opinion. This is why I have tons of files saved as “possible EVP” or just simply “artifacts”. They don’t impress people as much, but until I can prove otherwise, that’s what they are to me. I’ve been tempted more and more recently to not only use two audio recorders (the normal routine for me) in experimental sessions here at home, but to also use a video camera. Your brain can’t log (and recall later) every slight move you make in a recording session. You thought you were sitting silently, but did you scratch your nose? Did your stomach make a quick noise? And in my case (embarrassingly), occasionally my breathing will have a slight wheeze to it… or a tiny squeak. And many times a good audio recorder will pick up a noise that you weren’t even aware was happening. Just like in a more typical paranormal investigation, a video might help you more confidently determine if what you are hearing can be ruled out. When it comes to radio sweep/spirit box sessions, I still very much consider myself a newbie. But I keep an open mind. And sure, I’ve heard my name a few times in investigations. I’ve even heard spirits read words presented on objects in the room. Those are notable experiences and responses that are probably worth carefully classifying as “EVP”. But if you have a white noise generator or a spirit box of some kind, do me a favor by doing this little experiment for me. Find a friend or two and challenge them to think of a common one-syllable response without revealing it to anyone. If you listen for at least a minute I almost guarantee that each person (if they’re honest) will report hearing their response. Now challenge them to all listen for the phrase “My name is Sylvia and I like pork chops”. Please contact me directly if you heard this one. But if you have a white noise generator or a spirit box of some kind, do me a favor by doing this little experiment for me. Find a friend or two and challenge them to think of a common one-syllable response without revealing it to anyone. If you listen for at least a minute I almost guarantee that each person (if they’re honest) will report hearing their response. So basically, I feel we just need to be more careful about what we’re so quickly and easily classifying as “EVP” or “paranormal”. But maybe I’m wrong. Maybe a spirit named “Joe”, who claims there are “five” spirits present, simply saw your Little Debbie next to the recorder and said “yum”. Yesterday’s post was on The Shroud of Turin. Today I present to you… The Receipt of Staples (you know you want to laugh). Take a look at this face! I see a boy with very neatly parted hair in a tux. But wait… do you see more than one face? I see at least three. The creepiest one took me a while and is in the middle and to the left of the word “online”. I make no claim that this is truly paranormal, and neither does the site that I believe originally posted this, or the man who submitted it. I’m certain this would be relatively easy to fake, being that it is digitized and online, and we don’t have much information about the source it came from, other than his name. 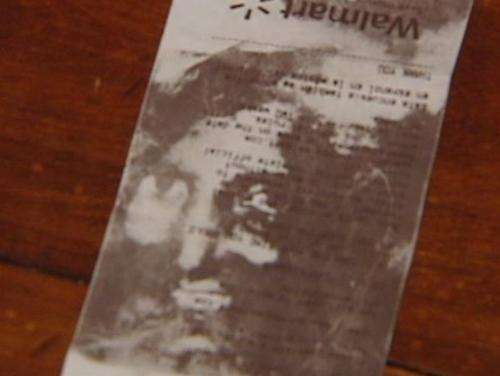 However, receipts these days are sometimes printed on a mysterious thermal paper with an image that seems to disappear quickly…and as a person who keeps all of his receipts in his wallet, if these receipts ever get wet, good luck reading what was originally printed on them. Wikipedia tells us that “most direct thermal papers require a protective topcoating to reduce fading of the thermal image caused by exposure to UV light, water, oils, grease, lard, fats, plasticizers, and similar causes.” Reduce these things? That tells me a certain amount of it is expected to happen, creating magic artwork on the paper as it gets crinkled, handled with greasy hands, left out in the sunlight, etc. 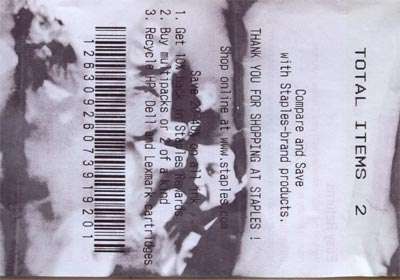 So it would be fairly easy for me to believe that a receipt could come out with patterns that would create a visual pareidolia… or recently referred to as matrixing. But is this little boys face a little too clear and perfect?